For many people their experience of ‘glossy’ screens comes from their shiny laptops, tablets and netbooks. This experience will undoubtedly have taught them the importance of regulating the lighting environment when dealing with glossy screens. Perhaps they can’t see (pun intended) the purpose of such a screen surface as they are unable to sit outside and make use of their device’s wireless connectivity in their sunny garden without being blinded by glare. Even in their brightly lit living room, they find themselves staring back at their own faces. The LCD monitor upstairs, on the other hand, sits there minding its own business with its nice matte screen surface and will display its image come rain or shine. 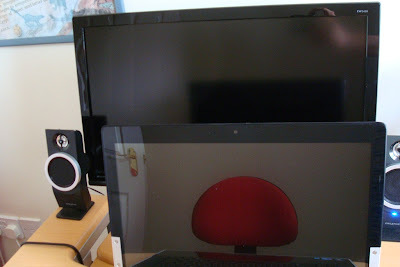 So why have monitor manufacturers such as Apple, Samsung and HP decided to bring glossy screens to the desktop computer? If reflections and brightly lit rooms can cause such a problem for glossy screen surfaces but not matte surfaces, why on earth would you go for glossy? 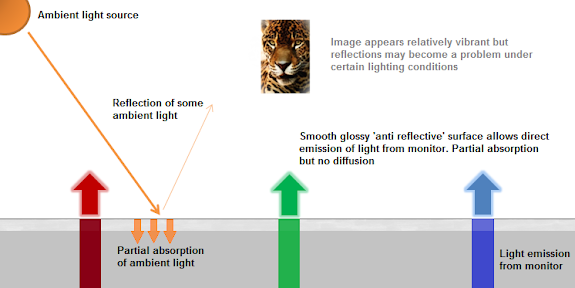 As is often the case, the answer lies with science and specifically, the way in which light behaves when it strikes both glossy and matte screens. Essentially the image displayed by the glossy monitor will have more intense and vibrant colours and will be clearer than its matte counterpart (all else being equal). 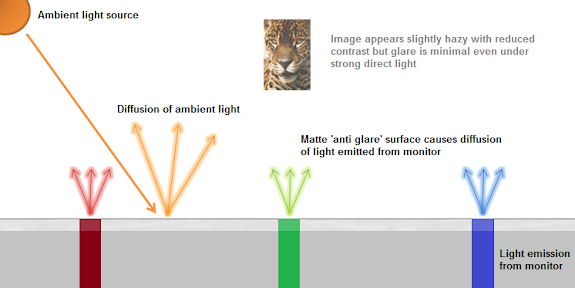 There is also a value associated with matte surfaces called the ‘haze value’ which indicates how strongly it will diffuse light – the higher the haze value, the more the light hitting the monitor and the light produced by the monitor will be scattered . If you use a low haze value, then the glare reduction won’t be quite as great but the image will remain relatively clear and a bit more ‘punchy’. By using a high haze value, which monitors such as the Dell UltraSharp series are currently famed for, you will reduce the punchiness and the clarity of the image but will have very effective glare reduction. For monitors in the latter category, people often comment on a ‘dirty’ or ‘grainy’ appearance on whites and other light colours. Some people are actually so sensitive to this that they notice the effect even on screens with a more moderate haze value. As with the reflections you get with glossy, everyone has their own sensitivity or ‘threshold of annoyance’, if you prefer. So next time you curse at your glossy screen or stare lovingly at your matte computer monitor, just remember that there are two sides to every coin. This is a guest post by Adam Simmons, who is an expert in the field of display technology and shares his expertise on pcmonitors.info.